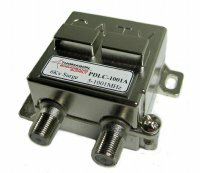 Passive Drop Line Conditioner (PDLC-1201B), 5-65MHz / 85-1202MHz split. Comes with internal 6Kv surge protection, two Zero pads and a RFI cover. Introducing the industries' first line conditioner designed for the "drop" side of the CATV plant. In our Patented PDLC the forward and return bandwidths are split and each are directed independently through a JXP pad socket. The technician is able to select either a pad, equalizer or cable simulator for each. He may also select a jumper (0dB pad) which will allow the forward or return band to pass unaffected. Used to compensate the negative tilt caused by long drops. Great for Power Supply locations with Status Monitoring devices. Attenuate the Forward not the Return on Short Drops. Use before drop amplifier for improved distortion measurements. Attenuate return signals that are too HOT. Ability to add linear tilt at output of RFoG for proper insertion into launch amp. Uses standard JXP style pads and EQs.